American Outdoor Grill T-Series 30 Inch Propane Gas Grill On Cart W/ Rotisserie & Side Burner:The American Outdoor Grill portable collection is designed for long lasting; unsurpassed performance that produces unbelievable flavor. All AOG portable grills come fully assembled (except side shelves) on large; durable 2 1/2 inch wheels. American Outdoor Grill T-Series 30 Inch Propane Gas Grill On Cart W/ Rotisserie & Side Burner:The American Outdoor Grill portable collection is designed for long lasting; unsurpassed performance that produces unbelievable flavor. All AOG portable grills come fully assembled (except side shelves) on large; durable 2 1/2 inch wheels. This model has dual side shelves; one of which accommodates the flush mounted 12,000 BTU side burner that offers the convenience of heating; cooking; sauteing and more. 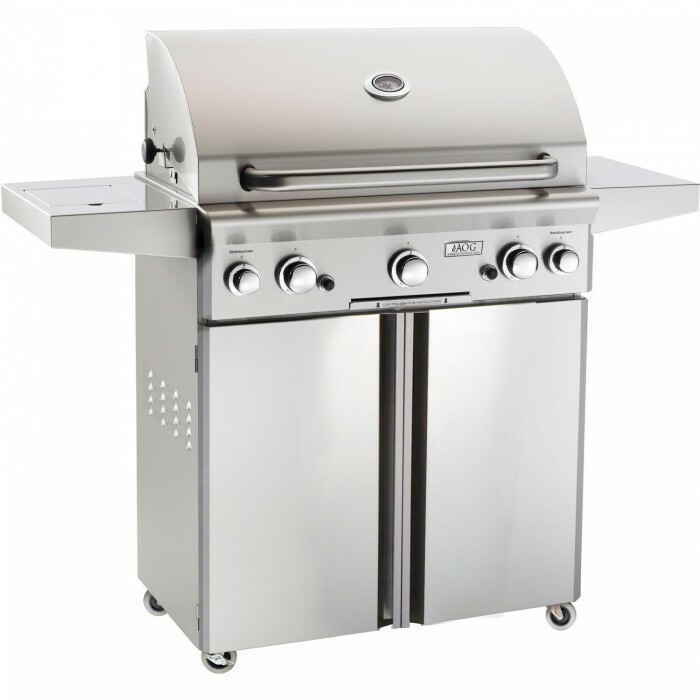 Made in the USA and built to last; this free standing propane gas grill has quality features such as commercial grade stainless steel construction; long lasting stainless cooking grids; and highly sophisticated stainless steel U shaped burners with integrated support posts for performance and durability; that produce 40,000 BTUs. If you enjoy grilling veggies; steaks; and chicken all year long then you will appreciate the easy to start electronic push button ignition; that is secured to prevent disconnections; for both main burners and side burner; 522 sq inches of primary grilling space; vaporizer panels (also called flame tamers) for even heat distribution; solid brass valves along with temperature controlled knobs to heat your food exactly how you like; a heavy duty warming rack to keep your food warm; a powerful 10,000 BTU rear burner with rotisserie kit that is capable of holding up to 15 lbs; and a funneled grease management system with a slide out drip tray for easy clean up. The beautiful double layered satin finish hood; stainless steel construction; and custom designed thermometer with stainless steel bezel of this American Outdoor Grill will add style to any outdoor setting. So whether you are heating chili; cooking rice or searing steak; this AOG 30 inch free standing grill will give you the performance you demand.